Smaller and less formal than his Food Social restaurant in Shieldfield, the former pub sits above the Quay Tap House overlooking the Tyne and is a lovely spot for watching people stroll along the riverfront. A little less contemporary and chic than the Shieldfield location, but charming in it’s own way. 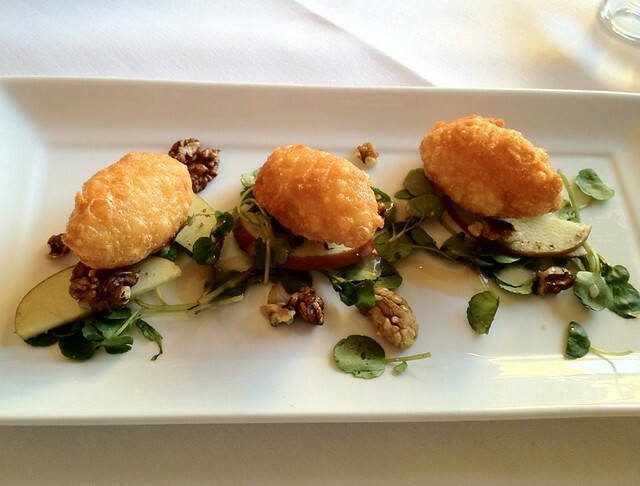 As for the set menu, we can wholeheartedly recommend it. To get food this good for that price is a steal. The offer runs early evening (5:30 – 7:00), and Saturday afternoons (12-5), as well as an a la carte (mains £8-12), and changes daily. Fresh ingredients at the forefront. The menu only offers two or three choices per course, but this shouldn’t be a problem when what’s offer is so good. We covered all bases and went for starters of cheese fritters, apple and walnut salad, and Ken’s squash soup with chantilly (pictured). Looking at the menu, the sourcing of the ingredients appears the same – Vallum Farm, Wallingford beef, Ingram Lamb etc. – a good sign. Cheese fritters are delicious – very light batter, and the soup, loved it. 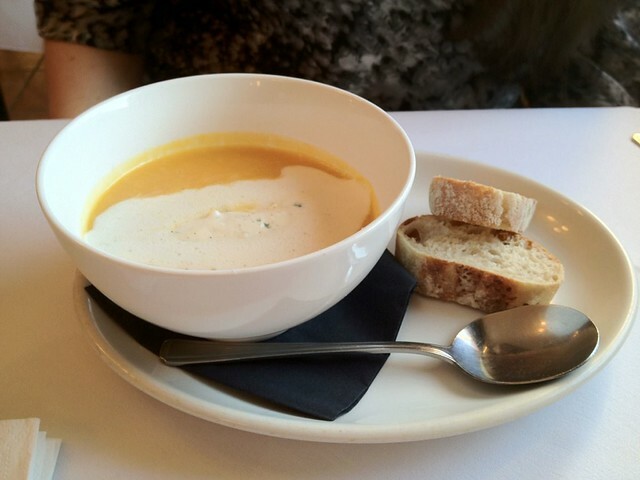 We’ve never had vanilla flavours in a soup before, but alongside the squash here it was a perfect match of sweet and savoury. Very satisfying. 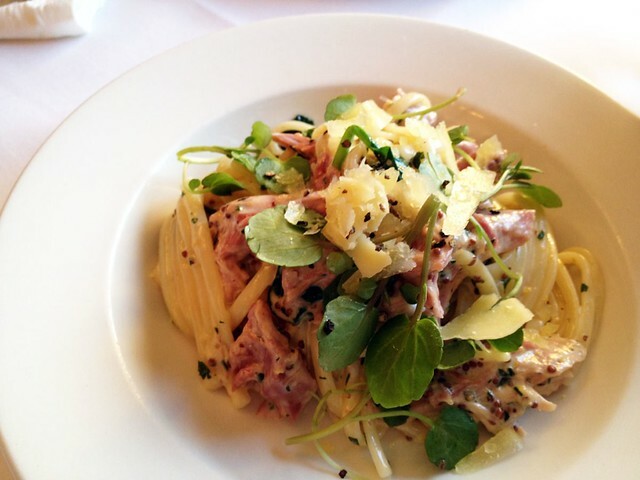 For mains, on offer today was haddock and chips, or ham and mustard linguine (pictured). If you’re a follower of us, you’ll know we had GOOD TIMES with the fish and chips at David’s main restaurant, so hopes were high that this would be a match for those. 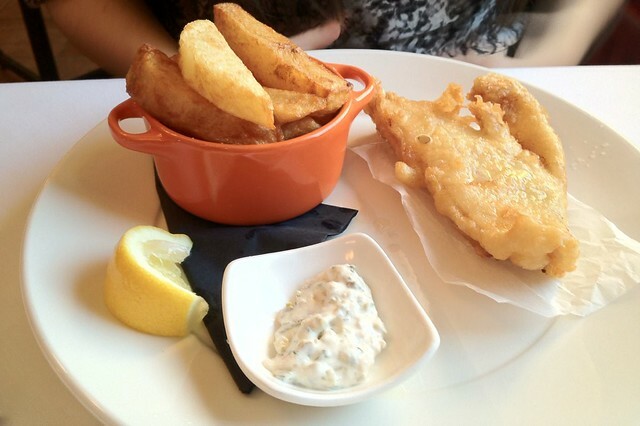 Certainly not disappointed – light and crispy beer batter, and a dainty, but delicious portion of haddock, with a tangy tartare sauce on the side. The dish came with skinny fries, but we elected for the thrice-cooked “proper” chips (£2) – tried and tested chip heaven. While the chips weren’t at the heady heights of Food Social (a little less crispy), still pretty good (see above and try not to get too hungry). The pasta was also full of flavour, coated in a herby and creamy mustard sauce, chock-a-block with shredded ham and shavings of cheese. Light enough to devour the portion, but rich enough to leave you satisfied. On offer for dessert was sticky toffee pudding, ice cream, or coffee. “We’ll have two sticky toffee pudding please…” We’ve had this pud before at the main restaurant, and it was much the same, i.e. delicious. Despite not coming with any ice cream or custard, a just-satisfying-enough small portion was a great way to round off the meal. Two three-course meals, two drinks came to £15. Decent wines on offer, though a smaller choice of bottles and beers on tap. Verdict: A great new place to eat in North Shields, and definitely another hit for David Kennedy. Anybody in the area, or fans of Food Social, or even if you’re neither, get down and try the River Cafe. Quality food at this price – and amongst a sea of pretty bad restaurants in the town, you’d be mad not to.